Delicate seashell tones blended with rich woods and leathers make this the perfect condo for ladies AND gents! 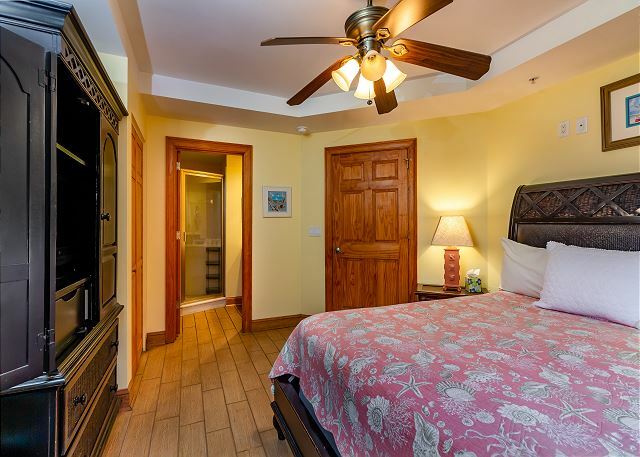 The two-bedroom, two bath layout leaves plenty of room should a couples' trip be just the thing for your visit to Tybee. The master bedroom boasts a luxurious king-sized bed and an ensuite bathroom featuring an enormous walk-in shower. The second bedroom has a queen-sized bed and is just steps away from the second full bathroom, which has a tub/shower combo. The fully stocked kitchen gleams with hardwood cabinets and stainless-steel appliances and looks out through the cozy living area, and the sumptuous leather sofa is perfect for cuddling up as the salty sea air wafts through the open patio door. Enjoy your morning coffee on the private balcony overlooking the pool and the beach beyond, or toast to a night on the town after a long day of playing in the waves! This is a hidden gem. We never go back to vacation destinations we have visited. We will be coming back to Tybee and Beachside Colony Resort. Great location, great property. A wonderful experience overall. would recommend a few updates prior to next visit:fixing faucet in kitchen prior to next guest - there is a note on counter that states 'faucet will be fixed tomorrow' yet no one came to fix faucet - it turns almost 360*. There were no sheets left for the hideaway bed in the couch. there were no trash bags left for kitchen trash can. there was dust and dust balls under the bathroom counter in master bath where it had not been swept. the air was set on 70* and would not go below same - 68* would have been more bearable. the furniture is worn and had furniture covers that kept falling off when you sat in the living room chairs. otherwise, the stay was pleasant and nice location to the beach. would stay at same resort. Loved having so many options for both kids and adults. Pools, Beach, Restaurant, Bar. We really didn't need to venture out. Parking would have been a nightmare on a holiday timeframe should we have needed to find food. We were definitely happy about having everything we needed in one location!Housekeeping could have been a little more detailed. (floors, utensil drawers and coffee pot and no batteries in the guest bedroom remote). Normally tv is not on the agenda, but with a 5year old..... There were plenty of dishes, pots/pans and utensils for our purposes. A/C worked beautifully after a day on the beach:>) We will return to Beachside Colony again for another family staycation! Great facility, but needs a few touches, such as small areas of baseboard were missing, and the dryer vent was broken. No comparison with motels on the island, which tend to be beat up and dirty, even in May. I enjoyed the view. The weather was pleasant even though it rained. The condo was furnished nicely and the view was wonderful. Unfortunately, it wasn't very clean. My daughter found potato chips in her bed, and the floors were filthy. My grandkids feet were black after going barefoot. We had trouble with the a/c, reported it three days in a row, and finally was told it was broken and we would have to move to another unit. So we had to pack up, with three days to go and move everything. Wouldn't stay here again. We had a delightful experience staying at Beachside Colony. Great location and wonderful to have delicious food from The Deck restaurant conventiently located beside the pool area. On our trip home from Disneyworld, we stayed overnight. It was a refreshing break from the road trip. We enjoyed the beach, the pools and Marlon Monroe's for dinner. 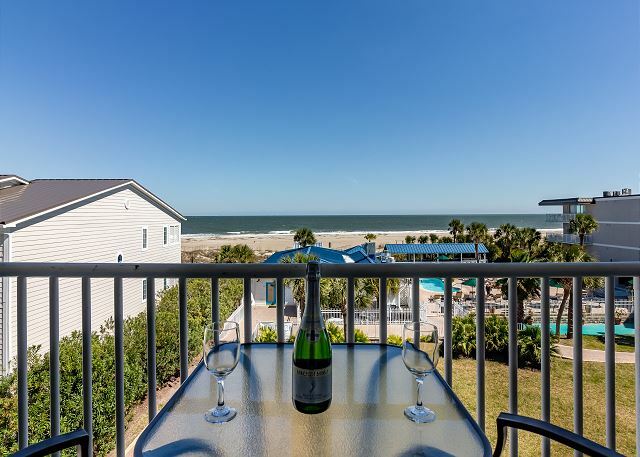 We enjoyed our time at Tybee Island and would recommend the beachside Colony resort. It was great for families to have a full kitchen and two bathrooms within our apartment rental. The view was beautiful from our balcony. Although to be picky, the sunrise was blocked by surrounding buildings during the days we stayed there. We appreciated the showers having a hand held spray to wash off sand from the beach, which was helpful with a toddler. The beach was so close and serene. Liked that it was not too full. The pools were nice…we enjoyed the infant pool the most as it was perfect for our two year old to play. The other two pools were a little small and crowded during when we were there (they were definitely for kids to swim or adults to relax). Hard to swim laps or get good exercise in those pools. Since the trip was to enjoy with family, we didn't mind. My only one major complaint was that there was this emphasis on cleaning the apartment unit when we leaved. This was even though there was a cleaning fee charged (that we knew about it before hand). I felt we were pressured to satisfy everything that was on the list at checkout. I mean I don't mind doing either/or but not BOTH especially when I'm on vacation. The list had things such as we must throw out our garbage or we might be charged with leaving it in the apartment after we left. I'm wondering what the cleaners actually do. I just felt that was a little unreasonable. Either don't charge an extra fee or allow some things to be left without possibly charging us another fee! Tybee Island is a great getaway. We've stayed in this unit at least twice and have enjoyed it very much. The furniture and decor is showing some age, but it's all clean and does the job. It was an extremely hot week and the AC kept up like a champ. The property's closest stairwell was being repaired, so the trip to the ground level was a bit longer. We hate leaving this little spot when our week ends! This place was amazing. For the cleanest to the security. And all the staff members was polite. My next stay will most definitely be here again. Thanks for the pleasure Beachside!!! ???? We enjoyed our stay in the condo unit we rented at Beachside Colony. It was spacious and the amenities of the community was great. The front desk personnel being available for extended hours each day was great ~ in case there was a question about the condo, etc. Extremely professional and well run property. It was fun and we enjoyed ourselves. Very comfortable beds. Full kitchen, washer and dryer, beautifully decorated. Felt at home. The children enjoyed all three pools. Housekeeping responded very quickly to our call. Definetly worth it and will stay there again!! I took my grandchildren for the third time to this lovely place. It is very conveniently located, and the condo was just right, with a beautiful ocean view from the balcony. We stayed 4 nights in low season. Booking was easy and best done by calling personally to explore all options beforehand. The room had a wonderful direct ocean view and the pool did not detract from the view in any way. 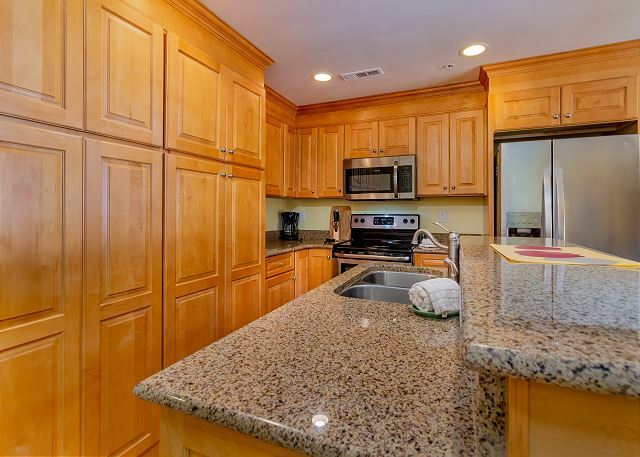 The condo has upscale finishes, and is overall well appointed. 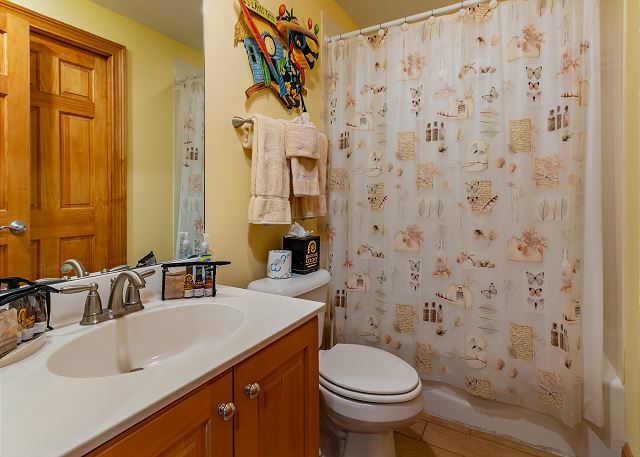 Bathrooms are a little cramped, but still very nice.Will highly recommend this condo. Nice 2 bdrm/2 bath. The master was awesome, the 2nd not so much. View was good, pools were nice. Close to Savannah for nice dinners. Beach nice. Good place to stay! Room was clean as always. We were very pleased with location of the room. We could see pool and the ocean. This condo was very nice and most of the anything you may need supplied. The condo was in a great location. We had a view of everything from the pools to the beach. The pictures were spot on and the staff at the location were super nice and helpful. Having a restaurant onsite was great as well! While the units are non smoking, they don't discourage people from smoking on the balconies, and since we were on the top floor and the folks beneath us were always outside smoking, we couldn't really enjoy sitting outside, or even having the doors open to get the ocean breeze. I thought it was a bit pricey for what we had access to because the amenities needed some TLC. You can tell it is an older building, but the interior condo was updated. We had some issues with sand being in the bed, but it was between the top sheet and the blanket, but you can't be surprised when located so close to the beach and the fine sand gets everywhere! Overall, it was an enjoyable stay. First time to Tybee Island! This was our first time visiting Tybee Island and we will definitely be back!! The room had a perfect oceanfront/beachfront view! 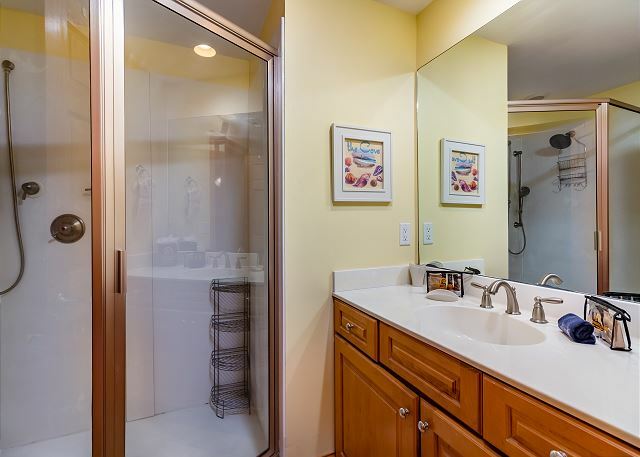 The condo was spacious and provided all of the away from home amenities you could ever need! However, we did run out of trash bags because it was a must that you emptied your trash or you may gain extra housekeeping fees and the front desk was not willing to provide extra bags which was very frustrating. Also, the condo is beautifully decorated but could use a good scrubbing! There are pen marks all over the walls and doors and the walls could use a fresh coat of paint. The check in time was 4pm which is way too late when you're wanting to begin your vacation, having to wait that long makes you waste an entire day that you're paying for. Overall, it was a wonderful trip and we can't wait to return to Tybee Island! We'll be back again next summer! Perfect. The condo was clean - exactly as the photos showed. All the amenities were great and the beach was fabulous. Highly recommend staying at Beachside - this was our second visit and we'll be back in 2015 for a third time. Charming community -- nothing but good reviews from our family. 2nd stay even better than first! Lovely view, lovely condo, couldn't ask for more! The beach was pristine, beautiful and fairly easy to access. Everything was overpriced and there were additional costs revealed at check in. I wouldn't leave Florida again to go there. We enjoy the beach. Over all the rental experience is positive. We love beachside colony and have stayed here for 5+ years now but this year they chained the gate access to the beach shut, so getting to the beach for those evening walks is almost impossible. We finally found a way out of after walkng all the way around the building and though a massive mud puddle but it's EXTREMELY inconvenient!! Also the pool associate representative takes his job extremely too serious to the point of discomfort almost. Need to remember we are paying customers!! Room was amazing and clean and check in check out was a breeze! Very sweet ladies! I would recommend a vacation stay at Beachside Colony If you are looking for beach experience away from the trappings of this materialistic world. It reminds me of a smaller version of Port A, Padre Island, TX. with its laid back atmosphere. Food on the island and at Beachside was delicious. Condos were pleasant. Only had two complaints, not enough towels and the uneven walkways going to the condos. Great time!! Savannah is definitely a perk for Tybee. We enjoyed a trolley experience in historic Savannah. The Tybee lighthouse is so quaint! The drive to and from the island is beautiful. Wonderful view of the property and the ocean. We spent each evening enjoying the balcony. The rooms were large and updated with new furniture and a beautiful kitchen. The master bathroom shower was refreshing after a long road trip. I would highly recommend this property. The staff was professional and courteous. Pet Friendly....I don't think so! The condo was very nice, clean and had a great location. I really enjoyed the pool and the resturant located there. We bought our pets, but had to cross 4 lanes of traffic to get them to a place to potty. Overall, we were very satisfied. The location was terrific and the condos comfortable. We all had trouble figuring out the TVs, though. It would have been nice if some basic kitchen stuff, like salt and pepper, coffee filters, had been there. Beds were comfortable and it was nice that the AC was on when we walked in all hot and tired from our trip in. All in all a good time was had by all. Our girls enjoyed themselves was most important. They had fun! The unit we stayed in had a great view of the ocean and the pool! Inside the unit was very comfortable, clean and pleasant. I loved the floors (ceramic tile with a wood grain) they are practical and perfect for the possibly of wet and sandy conditions. Master shower was great and loved the two shower heads. Tybee Island is a laid back place to stay and relax when you really need to get away. I love that we were only about 16 miles from Savannah so that we could stay at the beach and still enjoy all that Savannah has to offer. We can't wait to come back!The condos are fun to stay in with the best views.We are always sad to leave from there ,we just love it. I have been bringing my family to Tybee once or twice a year for the last 12 years. We love it so much and Beachside Colony is the perfect family location. With very clean condos, onsite restaurant and three pools, you cannot beat the layout of the property. The condos could use some updating soon but the units are always extremely clean. We will be back next summer!